This idea seriously came to me in the middle of the night! 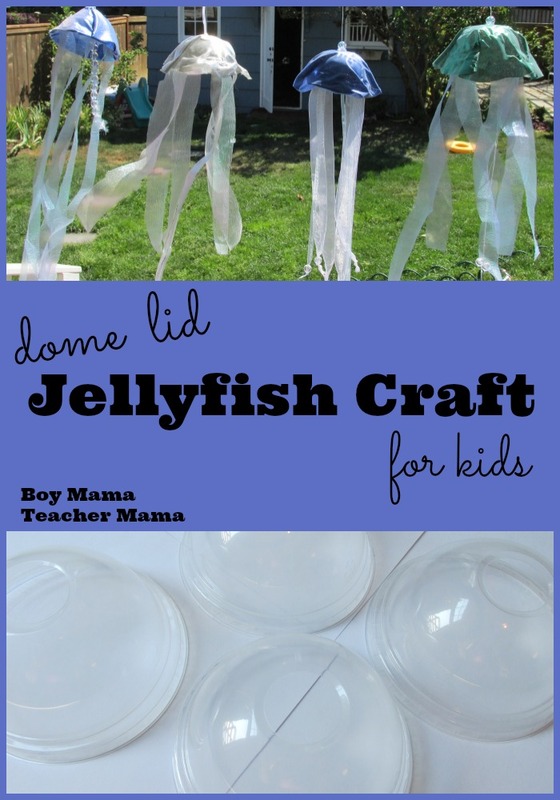 For some reason I was thinking of the Starbucks’ dome shaped lids and like a flash of lightening, I thought a JELLYFISH craft for kids. The next day, I went to our local Starbucks, ordered my tea and asked for a few extra dome lids- which they kindly game me- and we headed home to create. Jellyfish are not actually fish. Jellyfish have been around since before the dinosaurs. A large bloom can have over 100,000 jellyfish. Some jellies are poisonous while others are harmless. Some jellyfish are as big as humans while others are as small as a pinhead. 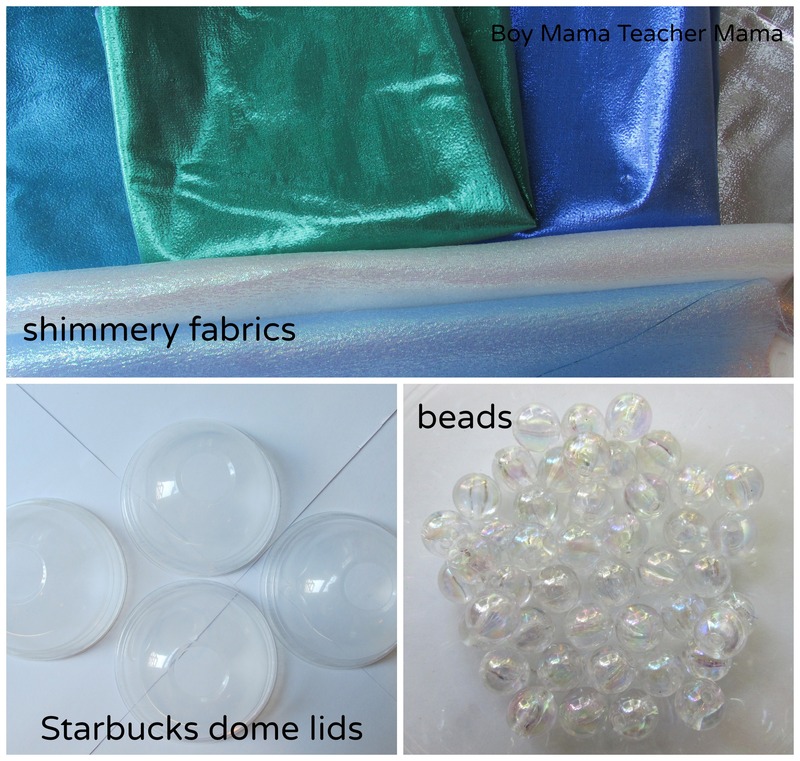 Choose the fabric you would like for the hood of the jelly. Trace a circle a little larger than the lid and cut it out. It is not necessary to cut it perfectly since it will be tucked into the lid in the next step. 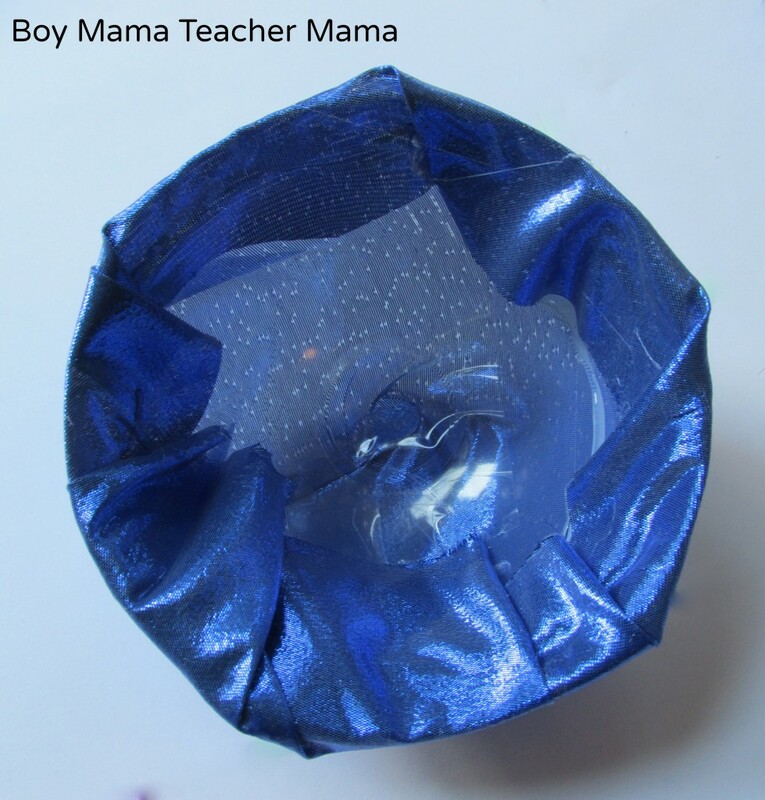 Warm up your hot glue gun and put a dab of hot glue at the top of the dome lid. Lay the fabric on the dome. 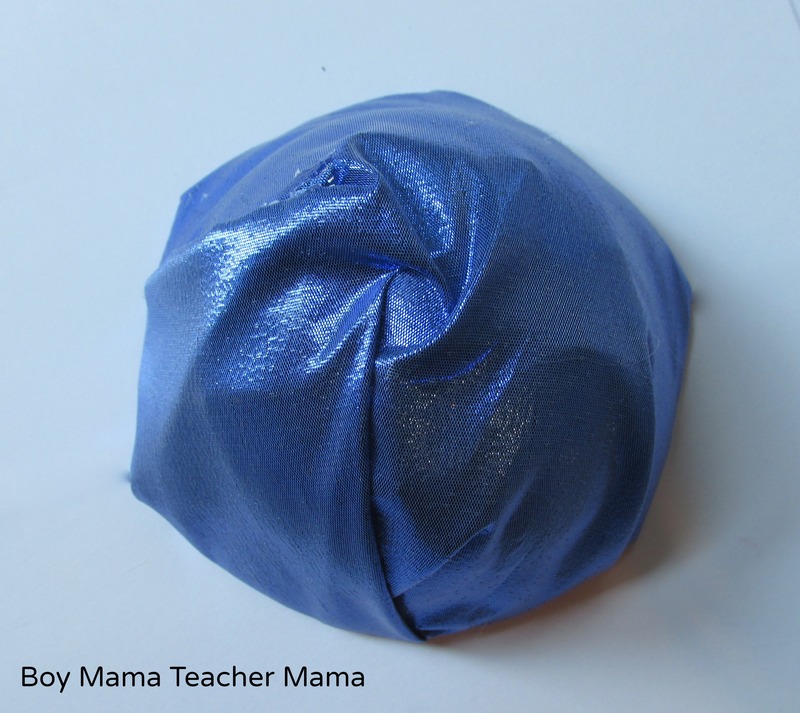 Then add more glue to the lid as you attach the rest of the fabric to the outside of the lid. 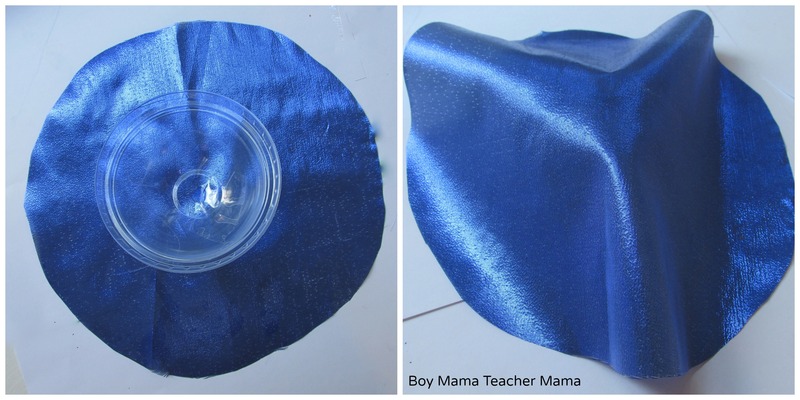 Once the outside is covered, put hot glue on the inside of the lid and tuck the edges of the fabric into the lid. 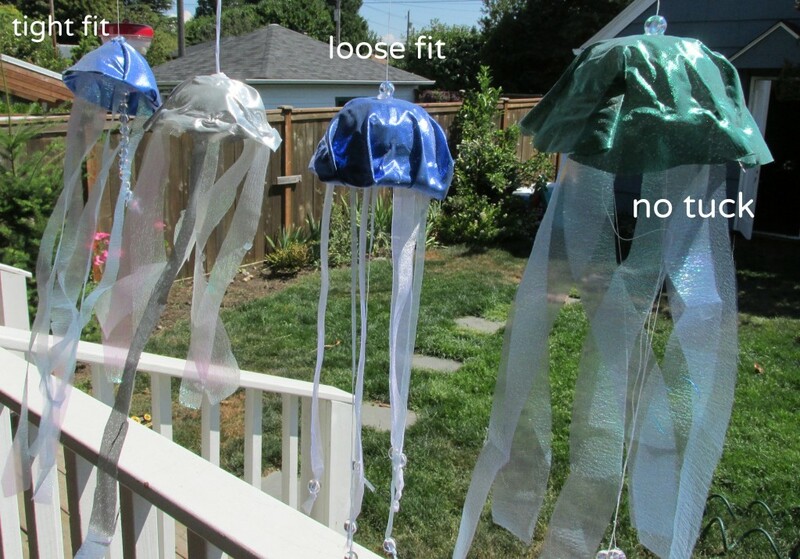 The jellyfish’s hood will look something like this when you are done. After we did one this way, we tried a few other ways too– not tucking the fabric in and just letting it hang or doing a loose tuck. All three ways came out really well so it is really a choice! The next step is to add the tentacles. For this step we used some of the shimmery fabric we purchased, some organza ribbons we had in our craft box, thread and the beads we purchased. Some of the tentacles were simply strips of the fabric. We also added the beads to the fabric and put a knot in the ends. 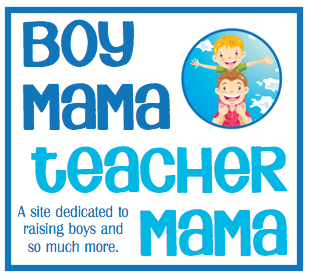 We did the same with the ribbon and with the thread. All ways created a different look, but all looked as if they were tentacles flowing in the water. The last step was to attach the thread for hanging our jellies. 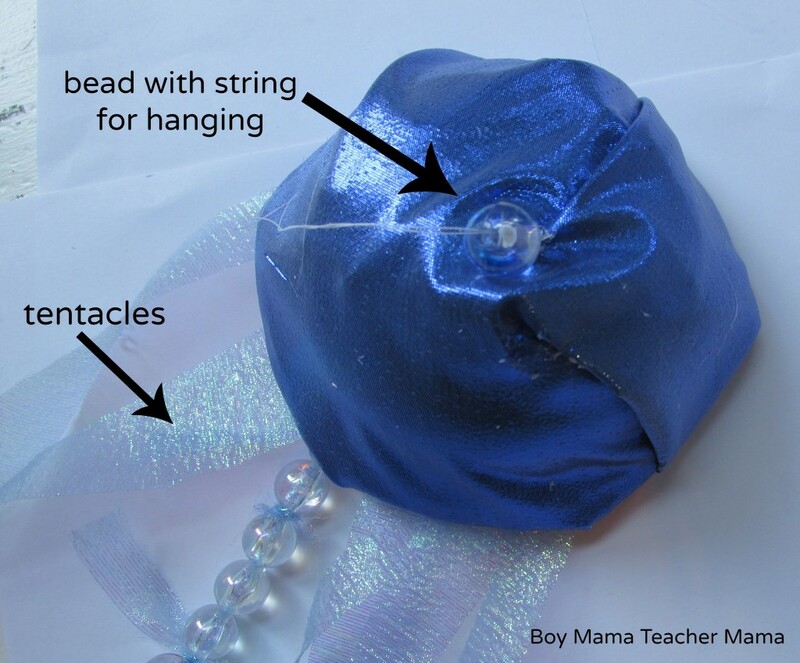 We simply put the thread through a bead, tied a knot to keep it from slipping out, attached the bead with hot glue to the jelly’s hood and allowed it to dry. And now your jellies are done! These are beyond cute Stephanie. 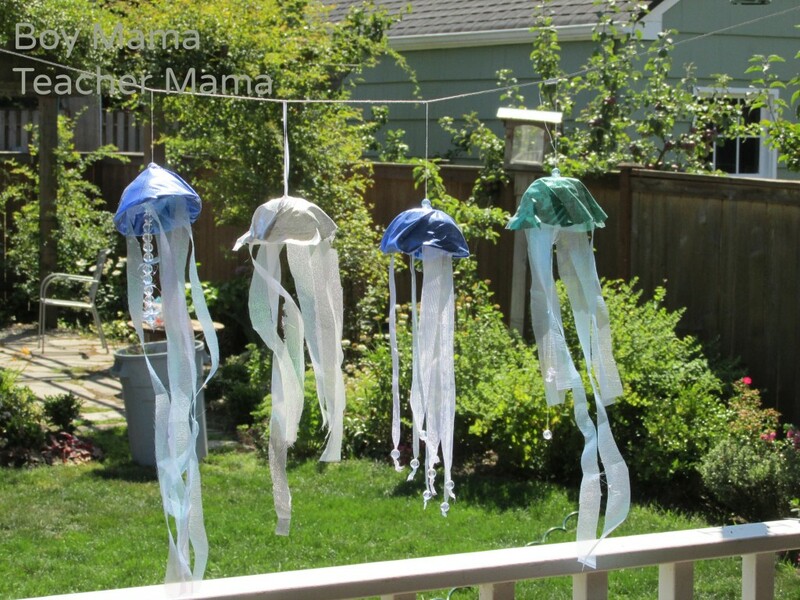 How lovely to have these hanging in the yard, and watching them “swim” in the breeze. WoW! That is so clever. I drink a slurpee the other day and it had a similar lid. Thanks for giving me this idea. I’m about to go and collect it from the recycling. Would hate to see your dreams!! 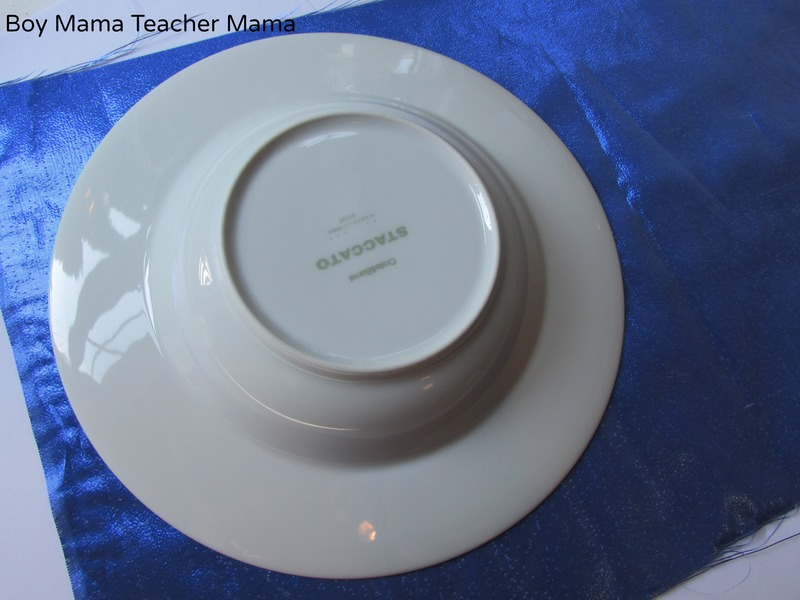 But these are just gorgeous and what a great idea to use the lids! So pretty and I bet lots of fun to watch in the breeze! My kids went through a period of adoring jelly fish… one of my girls even has a soft toy jelly fish and we sang that jelly fish song constantly for a while. 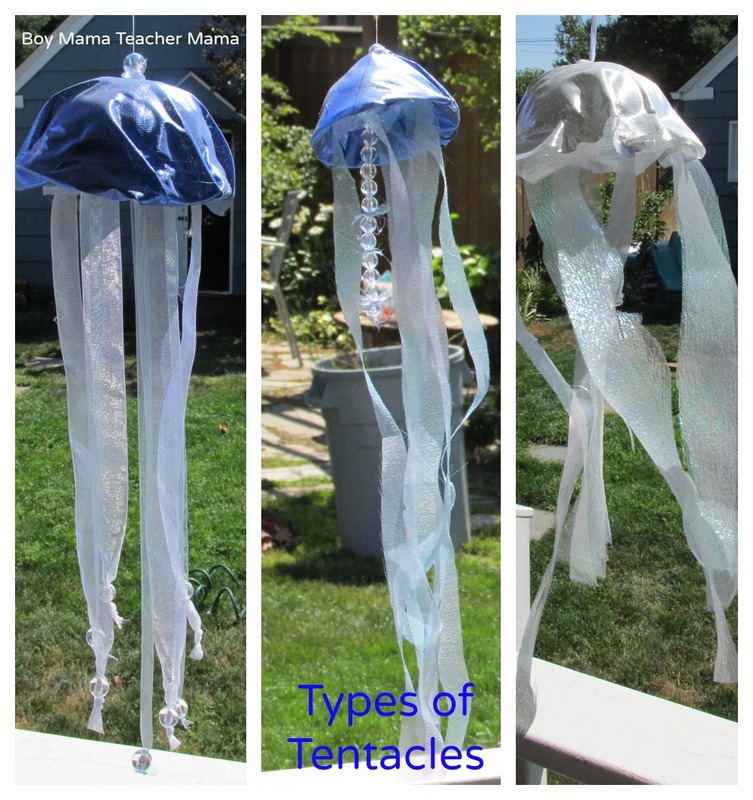 These are really cool and I think my smallest might become jelly fish obsessed too now! These look so good hanging up there in the sunshine!! I love it! 🙂 Will have to give these a try! This is cool, I bet they look beautiful shimmering in the light too. I also just learnt more about jelly fish than I did during my entire school career 😀 100,000 jellies in one single bloom, yikes!! They do look beautiful! Thanks Caz!